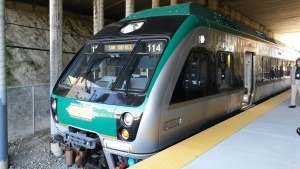 SMART (Sonoma-Marin Area Rail Transit) is a commuter rail line (using diesel multiple units) between Sonoma County Airport and San Rafael. 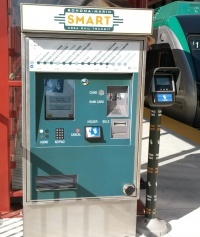 SMART operates as frequent as every 30 minutes. SMART connects with various bus systems in the North Bay including Golden Gate Transit, Marin Transit, Sonoma County Transit, Santa Rosa CityBus, and Petaluma Transit. Before boarding the trains, pay the train fare with SMART eTickets app on your smart phone or with a Clipper card. Clipper card can be purchased (or load cash values or 31-day pass to an existing card) from the ticket machines on the station platforms, which accept cash or credit/debit card. Clipper card riders need to tag card before boarding and tag again after exiting the train at a reader located on the platform. SMART does not offer paper tickets. Fares on SMART are determined by the number of fares zones you plan to travel. SMART uses the proof of payment system and passengers caught without a valid fare are subject to eviction and/or citation. There's a maximum daily fare on SMART. SMART railcar offers vertical rack as well as horizontal stack rack (found on Caltrain) in the fold up seating area. SMART rail cars feature level boarding access at all stations.